My thoughts are with Boston tonight. The marathon explosion took away 3 lives and injured more than 100 people. Not only the city of Boston but also everyone around the entire nation is going through the chaos to rescue and help out victims. The media has been on the roll to provide updates on news, stories, and government’s responses. 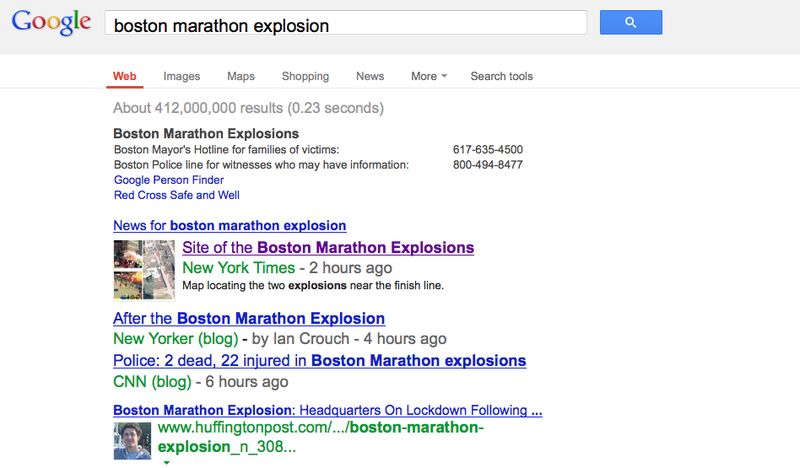 Google has generated at 412,000,000 results within 0.23 seconds with keyword search ‘boston marathon explosion’, by 10PM on the day of the event, April 8th, 2013. More importantly, there are also resources integrated by social media as emergency respond activities. NBC News published an article, Boston Bombing Aftermath: How You Can Help, giving tips to families and friends to get involved and to initiate help to the victims. The most impressive tools are Google’s idea on gathering information of people who have a place to offer and of people who need a place to stay. The first person to fill out the Google form started at and every 5 seconds comes a new entry. There are also individualized the information with section ‘Other info’. The affect of social media in emergency is indeed very powerful. Besides the good deeds and how much social media can be helpful in responding to crisis, it could be a useful marketing and emergency management tool for non-profit organization such as American Red Cross, Maryland Emergency Management Agency, Federal Emergency Management Agency, hospitals etc. American Red Cross comes up with mobile apps to motivate people to prepare during emergency and crisis, by providing information, useful tools and a way to let loved ones know they are safe. Fundraising through online social media campaigns. Volunteer recruitment and team building (How to Help Boston Marathon Victims). Online collaboration tools such as FEMA’s Collaboration Community where people can exchange ideas of what to do in responding to emergency. This enhance emergence preparedness. Effective communication method with stakeholders, victims, decision makers, etc. which improve control and support faster service and broader engagement. With Dell’s support, Red Cross utilizes Social Media Command Center right after a disaster in order to find survivors who desperately need help. It is a two-way communication between the general public and these emergency response organizations. It is a method of crowd-sourcing.